I started this school in 1936 and left in 1945. I believe it to be the oldest school in Mansfield and does not appear to have changed at all. I have just come across this page and it was very interesting to be reminded of so many of the teachers and pupils at Moor Lane School. The memories came flooding back. Mr Warrington was my favourite teacher and I remember Mr Thomas, Miss Brotherhood etc. etc. I lived on Bancroft Lane and went to both infants and junior. I remember that line down the middle of the playground separating the infants and juniors and those cold outside toilets. I remember making daisy chains on that enormous playing field. Happy days! I was there from 1956 if my memory serves well and I remeber some of the names already mentioned – Ian Wilson, were you in my class? other names are Julie Moorhouse, Christine Dring, Susan Wright, Suzanne Chapman. I’m still in touch with Suzanne but it would be great to hear how everyone else is doing and if there’s anyone out there who remembers me. I get back to the UK every couple of years or so so it would be really good to meet up with any of my old school friends and catch up on how life has treated us. I just read a comment about Arthur Smith, who we knew quite well. The surprise is that it was from my cousin Colin Sheard…. I have not heard of him in decades.. what a very pleasant surprise. Yes Colin we all have fond memories of growing up at the top end of Moor Street. Hi ,as a youngster I lived in Moor St and went to Moor St School until 1966.I have fond memories of Arthur Smith as I used to help him on his rounds when he had an old blue and white bus.My granny Price lived right opposite his yard at the top of the street.Sadly I left Moor St in 1966 and moved to Pleasley and lost touch with everyone. Hello Carole Wells nee Trapp. I lived in the yard above yours, our back doors faced each other on little Moor Street. You lived at 34 and l lived at 36. l went to Scotland with you and your family to your Grandmothers in Dunoon. 1957/ 1958. You moved onto Victoria Street whence Freddie Needham appeared. Do you remember meeting me at East Midlands Airport when you came for an interview with British Midland? l worked for British Midland in Flight Operations before moving to Bahrain. Hope you read this message as it would be nice to hear from you. Hello Lynette, thank you, I wasn’t far out in my estimation of where no. 64 was, working it out roughly from where my Grandparents’ house was, no. 82 which was where I lived until February 1950. I didn’t move far, just up to the top of Westfield Lane until September 1955 when I left Mansfield to return again, back to Moor Street, for a few months in 1956/7. I came back again to Moor Street for four months before leaving again this time to progressively move round the country plus a couple of periods in the Near and Middle East. As I said earlier, I did visit occasionally, in addition to the aforementioned weekly visits, whilst my Grandmother was still resident in no. 82. Yes, I do remember your Uncle and Aunts but I have to confess that the passage of time has rendered that to be just a vague memory. Hello Martin Yes my mum was Peter’s sister. Do you remember my Uncle Tommy, Auntie Sue and Auntie Meg? 64 Moor Street was on the first terrace houses across as you went down the street. Hello, Lynette Hopwood, thanks for the mention. Was your mum Peter’s sister? Your time in Moor Street is a little later than mine, whilst we probably didn’t meet, our paths may have crossed as I visited my Grandmother, at 82, quite often, especially between November ’63 and July ’64 whilst I was in Sheffield. I would come down on a Tuesday evening. After I had moved to Rutland I would also drive up occasionally. I’m trying to envisage where 64 was, was it in the short row on the bend where Marsden’s was or was it just round the corner near, I think, the Townroes? I’m presuming that you must be younger than me, whilst, of course, not wishing to ask a lady’s age! Where are you living now? I am trying to research my family and believe my father and possibly my mother went to Moor Lane School. My mother May Slack lived at 83 Victoria Street along with her the rest of the Shooter/Slack family. My mother was born in 1915. I think my father Simeon Morris born in 1914 live at 46 Moor Street along with his 2 brothers William and Albert. They must all have gone to Moor Lane school. Also Pam and Kevin Shooter. I would be interested to hear from anyone with any knowledge of them. Hello Lynn, I remember the Goodwin Family, more so Eric Goodwin, the son. You are correct in saying he was a good footballer, I used to play some football with him on the Hayfield, and I believe he once played for Mansfield at Field Mill. He was also a first class swimmer. Being a tall athletic man, he won many races at the Galas’ at Mansfield Swimming Baths. That would have been in the 40’s. Eric married a local girl Hilda, she worked at the same factory as my wife, F.C.& W. Sadly, I believe Hilda died in a motor accident, and Eric being still on the young side, remarried. Allan Brown, the name does ring a bell, unfortunately, I cannot bring him to mind. There were a few Browns in the area, and I being born in 1933, was in the same era. The Goodwin’s were a lovely family, living in hard times, Eric and Hilda were a couple we spoke to until we moved from Bradder St. Best Wishes Alan. Good afternoon Does anyone remember Allan Brown who also had the name Allan Goodwin? He was born in 1937 so would have attended Moor Lane School approx 1942-43. He lived on Princess Street untill he was 18 with a family - Mrs Goodwin. Mrs Goodwin had a son was was very much into football and still lived on Princess Street untill 2013 when sadly he passed away. I attended Moor Lane School in 1969 stayed there for 5 years, Lynn Brown if anyone remembers me be lovely to share some memories thank you. Lived on Botany Ave, attended Moor Lane 1949, Lived in USA since 66. Tony Williams, thanks for your recollections of Moor Lane, I had forgotten about Wendy Phillips, she was in a different class than I was when I returned from Canada in 1959. I am sure many more memories will be activated by those who read your narrative. I certainly do recall 1 particular incident with the low wall. Like yourself a group of us were running around the school at dinner time and hurdling that wall. One boy, John Revill, got caught on the top part of the wall and fell backwards…. after hitting the ground he did not move for some time. We thought he was dead. A teacher came around and checked him out, fortunately he only had the wind knocked out of him. Miss Rowell , Mr Beasely and I had a special relationship I was in either of their offices at least once a week and I do recall getting caned across the hands by Mr Warrington…. do that nowadays and the teacher will be sued. Dose anyone recall that old gramophone record player Mr Beasley used play some classical songs on at some of the assemblies. Being named a hall monitor, complete with the little Moor Lane school shield badge was quite a memorable moment just before leaving Moor Lane to go to High Oakham. Hi Carole Welles (Trapp) we were probably in Moor Lane Infant school at the same time, left in 1956 to come to Canada ; which end of Moor St did you live. When going to Infant school we lived at 126 Moor St.
Nice to see that more people from the area are submitting their comments and from various regions of the globe. Lovely site – thanks. I now live in Mexico but went to Moor Lane Infant and Junior schools from 1952 – 1958 and then to Brunts Grammar, 1958 – 1964. Maiden name is Carole Trapp and we lived on Moor Street. Hello Richard. You mention many names that I knew from Moor Street: John Townroe, Pete Endersby (in touch but haven’t heard from him for a while), Colin Pye, Alan Morton, Mike Tomsett, Ray Sparkes, John Richardson, Dave Gretton, John Hatton. I recall the name Rita Wilson but couldn’t remember where from. Where are they all now? Hello Margaret & Carole It was so nice to read that someone from Moor St and off the Ladybrooke estate remembered us, thank you. I will pass your name on to Mum, however she may not recall , her dementia is worsening, she will be 90 this month. I do recall some girls coming over to play, perhaps my sister Margaret would know more than myself..
Gosh it seems as though those days spent on Moor St and the “estate” were only yesterday and I am happy that I was able to help you recall some of those “lost” and faded memories. It would be nice to hear more from those who lived in the area . Hello Tony . Sounds very much like another success story for Moor Lane School and Miss Rowell. Come to think of it, Miss Rowell was Moor Lane School, well the Infants anyway Miss Rowell Ruled Moor Lane School with a ruler. In my time in the infants, I also remember Miss Stanley, she was the only teacher to have an old car. Had a ride in it once, to the Hospital. I had all of my infants/primary education at Moor Lane, finishing in 1959. I then spent a year at Queen Elizabeth’s before my parents emigrated to Australia in 1960. My first teacher at Moor Lane was Miss Searcy (you were right, Margaret Hayes 16/06/15, she did exist! ), whom I remember as patient and kind. In fact I seem to recollect that Miss Searcy was my teacher right through Infants school and she was so nice I do believe in hindsight that I developed a childish crush on her. I encountered headmistress Miss Rowell, of course, who was, as some have said, rather severe. I used to pass her house on the way home from school each evening via Kirkland Avenue to Cherry Grove, where we lived. She had a rather fine rose garden. Actually, I had a bit more to do with Miss Rowell than most because she recruited me to the school choir and had me reciting poetry (‘Windy Nights’, remember that?) and singing Schubert at the Eisteddfod one year. We used to rehearse in her office. In the primary section I remember Miss Stanley as my first teacher. She was a shock after Miss Searcy and seemed incredibly old at the time, like a grandmother. Miss Stanley was also somewhat severe (she was the only teacher who ever punished me at Moor Lane - a dose of the ruler for persistently mixing up the points of the compass!). I remember mild-mannered and enthusiastic Mr Warrington as well: I was fond of art and also profited from his instruction in swimming (the latter was so effective that, in my first year in high school in Australia, I won an event in the school swimming carnival, much to the surprise of my new compatriots). I well recall the wobbly early morning trips to the Mansfield Baths perched on the crossbar of my father’s bicycle, and indeed Moor Lane’s own swimfest, during one of which we were required to backstroke a length of the pool in pyjamas holding a lighted candle!). Mr Beasley was headmaster during my time in the Primary School. I did not have much to do with him directly but I seem to recall that he was a small wiry man who spoke in clipped tones and was rather strict and distant from a child’s perspective. I have a distinct recollection of the sense of mystery and threat emanating from the door of his office when one passed it, especially when one was aware that some poor fellow student had been detained therein for a dose of the cane. My other primary teachers included Miss Billings, Miss Brotherhood and the formidable Mr Phillips (skilled in music, intimidation and swinging the long board-ruler in the vicinity of boys touching their toes). Does anyone else remember warbling the rousing tones of “Hold him down, you Swazi warrior; hold him down, you Swazi king” to the martial sounds of Mr Phillips at the piano? I actually shared a desk unit with his daughter Wendy for quite a while one year. She was a very good sport and seemed to seek no advantage from being the apple of the teacher’s eye. I was very competent at Maths and Science and very poor at Botany and Nature, whereas Wendy was brilliant at Botany but weak in the hard logic areas. We had an arrangement for a while whereby she surreptitiously gave me her answers in Botany tests when I was stuck, and I returned the favour when she was stuck in the other tests. All the whispering out of the corners of our mouths eventually aroused the suspicions of our class teacher (Miss Billings at the time) and inevitably we were separated. Finally, here are just a few more of the innumerable recollections of my Moor Lane years: walking to and from primary school with a group of friends each day, comparing each other’s Brylcreem-sculpted hairstyles and swapping vocal imitations of Tommy Steele and Elvis Presley; occasionally ringing Miss Rowell’s doorbell as we passed her house, and then running away; Gypsy caravans rattling past the school to the waste ground nearby where they set up camp; a particular intellectually disabled young man who used to try and grab us through the railings as he passed along Moor Lane, aroused by our heartless baiting; a new boy who gave two names for himself to the teacher and was punished for refusing to choose between them; egg-and-spoon and sack races in the field next to the school; the white line between the infant and primary playgrounds; how hard the bitumen was when you fell over or found yourself at the bottom of a squirming pile of fellow students (my first ever pair of spectacles was broken at the bottom of one of those piles); school milk and school dinners; the simmering rivalry between the two ‘gangs’ in my last year at the school (Paul Townroe’s gang, of which I was a member, and Harry Wragg’s gang) and the low walls in the playground over which, terrified of falling, one had to hurdle desperately when pursued by rival gang members; the long glassy slides we used to make in the primary playground when it snowed; at play-time looking up at the first-storey windows and invariably seeing one of the teachers keeping watch; school excursions to Haddon Hall, the Lady Bower Dam and an Abbey where the monks were under a vow of silence; PT in the assembly hall, and school concerts on the stage; and the sense of loss when friendships were severed through the harsh streaming imposed through the 11+ exams. Did we get a good education at Moor Lane? Well, I excelled at Queen Elizabeth’s among many strangers, and when I arrived in Australia and entered first year high school, setting aside my deficit of knowledge of all things Australian outside of cricket and tennis, I was significantly ahead academically in all the basic subjects. I think, when all’s said and done, we Moor Lane students were given a good start. My sister and I are sitting here feeling quite excited after finding this site all about our old school Moor Lane. Our names are Carol and Margaret Gunther, (now Carol Patterson and Margaret Hayes). We lived at 2, Moor Lane from 1947 to 1952 and then moved to 90 Jenford St. on the Ladybrook estate. We attended the infants and juniors during this period. We were so surprised to read comments by Mike Frost because we remember our mum and dad talking about the “Frost” family emigrating to Canada! We lived in the middle of the three cottages. The Fell family lived next door to us. The cottages were already condemned when we moved in – though very young we remember the toilets being at the end of the cottages and a bucket and cold tap behind the front door and the candles and oil lamps to light our way to bed it is incredible to think of it now. When we were eight and nine my parents brought us to Swansea in South Wales (as my mother was originally from here) and we have been here ever since but reading everyones comments particularly Mike Frosts has brought back so many memories to us. We are sure we used to come and play at your house sometimes. Maybe your Mum would remember our family. Margaret seems to think that there was a teacher called Miss Searsy ? or at least it sounded like that in her five year old mind, would anyone else remember her? Reading the comments and seeing the name of Mr Warrington brought back a few memories of being at Moor Lane School. Mr Warrington was an outstanding teacher and what a memory. Many years later when I was a lecturer at what used to be Mansfield School of Arts, walking up to Ashfield House through the car park I heard a voice behind me say “Hello Trevor”. It was Mr Warrington. I was in my forties, I hadn’t seen him since I was ten or eleven and he had taught me for just one year. He’d come to see the photography tutor at college. A day or so later, the tutor came up to me and said that he’d had a strange experience. He said that he’d been talking to a Mr Warrington and the strange thing was that it was like talking to me! He had no idea of the connection. Just discovered this site. It’s brilliant and brought back many memories of my time and the teachers at Moor Lane School from 1962-68. I remember as a 6 year old, reading one of the reading scheme books to Miss Rowell, then having to reread it backwards so she could check I hadn’t just memorised it! In the juniors, I was in the choir. At Christmas time, I remember walking down to the Baptist Chapel (later replaced by the bus station on Rosemary street) waving to old people in the flats on Sutton Road. I don’t know if anyone has mentioned Mr Thomas. My brother John was in his class for 2 years around about 1964. I don’t live in Mansfield now, but still visit my parents. My father was born in 1923, lived in Princes Street and went to Moor Lane, so I plan to quiz him as soon as I can. Does anyone know of the whereabouts of Keith Pritchard ? He was a very special bloke in my life and I often wonder what happened to him and where he is now? Hello everyone, after a brief hiatus I am back to reminiscing with the stories of Mansfield, especially Moor Street and area as well as Brick Kiln Lane . Lynette, we lived at the top end of Moor St. No.140 with my Grandma Price, where abouts did you live? Peter, “Killer” did the same to me, I was trying out for the school team and showed up with 2 studs missing off my boots. A gang of us had been playing on the hayfield on the weekend and the 2 came loose. The cobbler on Victoria Street, next to Mounteny’s grocery store was closed. Anyway Mr Phillips did not care for “ill kept” togs, so that was it for me. My chums Roy Overton and John Robertston made the team. I lived on Moor Street as a child and attended Moor Lane Infant and Junior School in the 1960s. I have very happy memories of my school days there. I remember a lot of the staff already mentioned. My special memory has to be our school assembly where we sang Summer Suns are glowing and Jerusalem. I too attended Moor Lane School, as did all of my 5 brothers and one sister. I well remember Miss King, my favourite teacher, she had slick and shiney brylcreamed hair and dressed very well. One of my most stark memories is of Mr. Phillips. I was a member of the school football team (left back) and on one match day I duly arrived at school but didn’t have any football boots. The reason I didn’t have them was simply because my parents couldn’t afford to buy them. Mr. Phillips was enraged when I told him about having no boots. He shouted, pointing at me “You will never wear a school football shirt again!”. I didn’t, and still don’t understand why he got so angry, it quite upset me. I also remember well the toilet paper, that was torture!!! Forgot to mention, Christmas time was magical at the school, pantomimes, balloons and presents. It is remarkable that the collective memories of past students of Moor Lane are so similar and in a time when schools and teachers are so often rubbished, so positive. I went to Moor Lane from the age of 4 and a half and have fond memories of those times in the 1950s growing up in Mansfield. My memorable teachers were also Mr Warrington and Mr Richards who taught me to swim and to play football but also how to approach life in a positive way through their encouragement. I still have the treasured photos of the swimming team trained by Mr Warrington( who could forget the mac) who swept all of the trophies in the Mansfield school competition. I remember Stuart Taylor, Susan Belcher, Robert Whitehead, Susan Horner and Alison Whose name escapes me. Likewise at football killer(Frank) Richards and our proud team along with Mr Booth the headmaster posing with the cup and shield unbeaten as I recall but the older I get the better I was! I remember Peter Allen, Paul Lockton, Kevin Statham amongst others the names long forgotten. I went to Moor Lane School in the 70s. I lived at 22 Moor St, with my mum Doreen, dad Sam (Vincent) and brother Stephen. I was five in December 1947 living at, 82 Moor Street and presumably started at Moor Lane infants in January 1948, unless I started in the previous September. I too remember Miss Rowell but never earned her wrath, as described. One class teacher I remember was Miss Davis (Davies?). Fellow pupils I can remember were:- Alan Morton, Michael Binch, Jennifer Fell, Martin Robinson, Colin Slack, Pat Cockayne. I left there in February 1950 and subsequently went to Broomhill School. I remember my years at Moor Lane (I was there from 1962 /1967), and all the teachers, I loved that school and went to Rosemary Secondary after. I started Moor Lane infants at thrr and a half years and left juniors in 1954 after passing 11 plus, remember Mrs Johnson, Mrs King, Mr Clarke adding to those mentioned above. Mr Warrington took art and swimming at Mansfield Baths, he wore a mac over his trunks(odd) he used to bike it to school I remember him getting a car. Killer Phillips worked on a meat stall on Mansfield Market on Saturdays. Nice to hear from anyone who knows me.I can still recall a lot of my classmates from the 40’s and 50’s. Just a little bit of info, my father went to Rosemary St School in the 1920’s and their nickname was the Rosemary Bulldogs. My father said Moor Lane School’s nickname was Moor Lane dirty necks! I can’t comment why!!!! Sorry guys. Was re reading some of te memories that people had of Moor Lane, both “Infant” and “Junior” The names of the teachers mentioned certainly do bring things to surface. I had forgotten about Miss Brotherhood, was there not a Miss Woolsley (sic ?) as well, does anyone recall the “dinner ladies” I think several live on Princes’s Street 1 near the Co-op and another at the bottom end closer to Victoria Street. Wonder if Diane was in the same class as me. Keep these stories coming in. Sure do Rex, and as the song goes ” I Remember You “…. Avis lived close to the Brickyard area…I also remember Alan,Margaret and Leon, but try as I may, I cannot put faces to them…Maurice Brown, knew him for many years after school. Great sportsman Maurice, especially Cricket and Football. He is pictured in many of the Cricket Teams on this site… Rex, I recollect you used to be quite a tall lad.. Regards….alan curtis. I was at Moor Lane fron 1936 to 1944. My last class teacher was Gladys Stokes and she was brilliant. Due to her I took the 11 plus exam when I was just a few days short of my 10th birthday and I passed. Does anyone remember my class mates -. Margaret Mounjt, Avis Berry, Alan Shelton, Maurice Brown, Leon Place etc? I know that all who went to Moor Lane School will agree this… Not only did we go to Moor Lane to learn…We were taught how to behave, we were taught manners, we were taught to respect our elders, we were taught to give up our seat on a bus to an elder or lady, all of this was good grounding to becoming an adult…..Miss Rowell and company didn’t do a bad job, did they ?…. Miss Stokes was an excellent teacher. I still remember some of the insights that she taught. I was in her class with 37 other children back in 1950. Gwynneth Roberts, Valerie Searson, Pamela Staves, Terry Cheeseman, William (?) Whitehead were class-mates. Mr Beasley was the Head and Mr Phillips taught sports and music, I think. Yes, I remember Miss Stokes very well….I too was in her class it would have been in 1939/40….She was a lovely lovely teacher….She organised the infants school play…It was Robin Hood , and I wanted to be Robin Hood….I didn’t get the part….I finished up playing Friar Tuck with a cushion up my cassock . Richard King got the part of Robin. I also was given a Triangle to play at school….O’dear ,O’dear !!!! Miss Stokes lived up near High Oakham School on Berry Hill… When I used to walk up to High Oakham, she would be waiting to catch a bus on Nottingham Road which would take her up to Moor Lane School….It was always . Good Morning Miss Stokes ! I was given a triangle too! Made me smile to remember that – only problem was that the triangle beat was so long in coming I still used to miss it! Anyone remember Miss Stokes as well? I think she was my class teacher for a year. 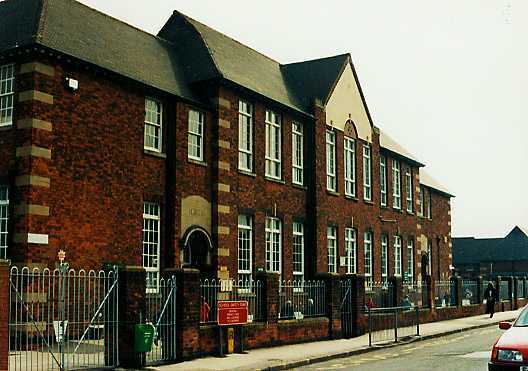 I attended this school from 1961 – 1967 starting in Miss Greens class at the infants and Miss Billings in the juniors. I doubt it is the oldest school in Mansfield though, that will possibly be Queen Elizabeths, and Brunts is also much older. There was a Miss Rowell at Carter Lane in the late Thirties and early Forties. Is it the same lady? she was a fantastic lady. The one I remember would not let me have a drum, I was always given a triangle or a tamborine apart from that as I say she was great! Wow ! How long was Miss Rowell the Head Teacher of the Infants School ??? Some of the comments relating to the strictness of Miss Rowell , I too can relate to….Once I felt the pain of Miss Rowell’s ruler on my legs…Cannot remember why ! Alan.. I started at Moor Lane Infants in 1960 and then went across the playground to the juniors. I can remember Miss Rowell as well – I think she was the one who threatened to smack me on my first day if I didn’t stop crying! Mr Booth was the best Headmaster around. There was also Mrs Bills and Miss Billings I think – both used to scare me. In winter we used to make slides on the ice and see just how far down the playground we could get. I started at the Infants in 1952 and attended both schools. I remember Miss Rowell head of infants as quite intimidating. My teacher at one point in the infants was Miss Barbara Davies – still occasionally see her! Remember Mr Beasley at the junior school – he was really nice. teachers there, Mrs Wilson – strict!, Mr Warrington – stricter!- “Killer” Phillips -never in his class but seemed quite nice. Also Miss Brotherhood – wasn’t in her class at all but really nice and always used to say hello if we met in town years later. I have been told that when Miss Rowell and Mr Beasley had a meeting it would often be in the playground and they would each walk up and down their side of the line which divided the infants side from the juniors! I was taught there at the infants for 2 years 1962/63. Infants headmistress was Mrs.Rowell. Juniors for 4yrs till 1968, headmaster was Mr.Booth, deputy head, music and sports was Mr (killer) Phillips I believe. How about seeing how many past Headmasters/Headmistresss’ and Teachers can be named from over the years. I can start with:- Heads: Mr Gelsthorpe.Mr Beasley. Miss Rowell.(infants). Teachers: Mr Badminton. Mr Anderson.